If you’re like any other SaaS marketing maven, you want to drive more sales in the best way possible. And if you’ve given it any thought, you realize the epochal importance of the free trial. Everything about the free trial is important. I would argue that the free trial is the most critical phase in SaaS sales. Most SaaS sales models place an enormous amount of emphasis on the trial, because, taken broadly, it’s the only marketing method that makes sense. But that’s where a certain amount of distraction sets in. 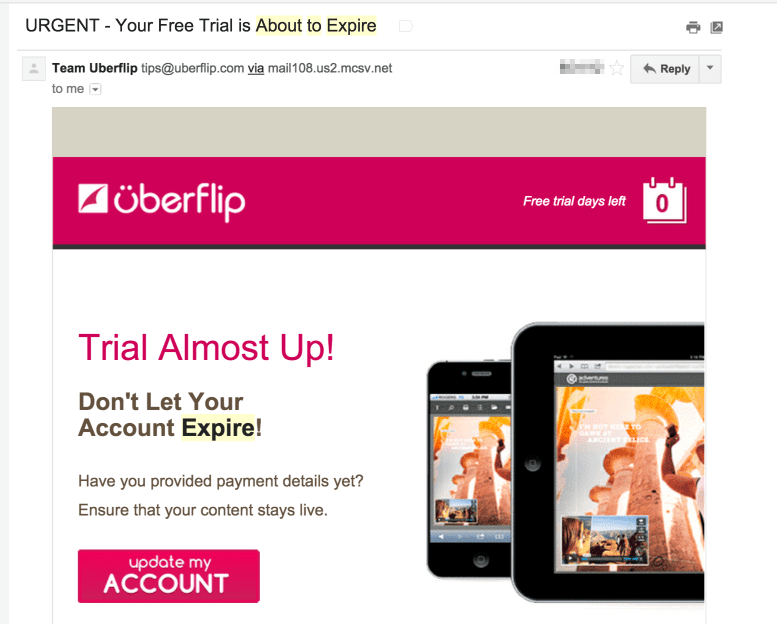 We obsess over all things free trial, completely missing the whole point of the trial — to get users to use the product! My goal in this article is to clear the table on the free trial period, and get our heads screwed on right so we can understand how to capitalize on the most important point in SaaS sales. Customer is aware of a need. Customer zeroes in on your product. Customer starts a free trial. Customer converts into a customer. 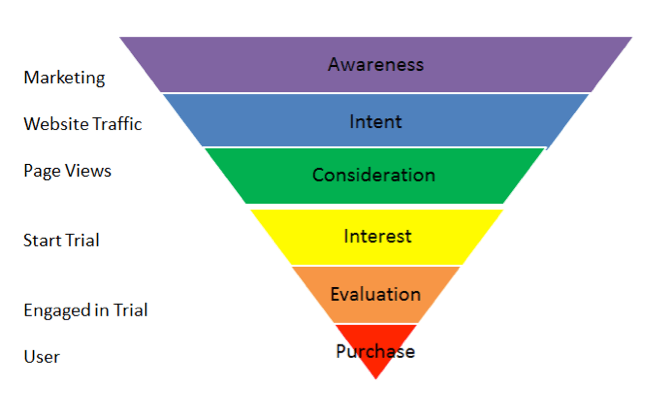 At point four in the list above, the customer is already deep in the funnel. The funnel diagram included below expands it a bit. You can see that the customer is there — starting the trial. They have just a couple microsteps to go until they are a full customer. Let’s look at another diagram of this point. This time, I want you to see just how critical it is based on what comes after the purchase point. 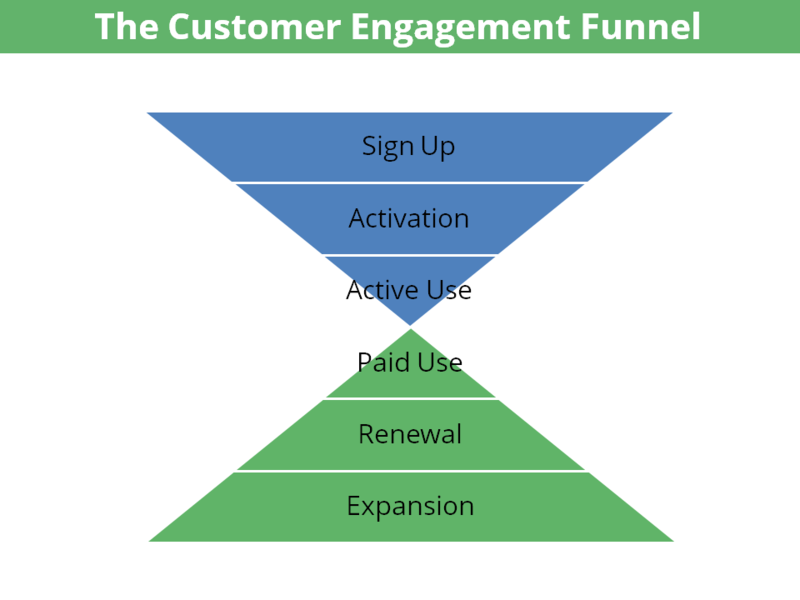 At the nexus of those two triangles is the transition from free trial to paying customer. You can’t experience the benefits without moving them on from the active use/free trial phase. See Where You’re Losing Customers! Using the Kissmetrics Funnel Report, you can create a funnel and see how many users are dropping off after they signup for a trial. You’ll even be able to drill down and see exactly who upgraded to paying and who did not. See this blog post for more details, or sign up for Kissmetrics to get started! And that’s where we need to focus on — getting the customer over the hump of free trial and into the utopia of a closed deal. One of the best ways to figure out how to get the customer to buy for good is to figure out why they started the trial to begin with. Why is a customer going to buy your product? Think through the answer, because this is kind of the whole point of your SaaS, right? What does the customer want to achieve, do, or experience? That’s the reason why your customer started a free trial. The motivation should be no different. If you are able to satisfy the customer’s need during the temporary trial, then you can compel them to remain a customer by continuing to satisfy them in the future. SaaS isn’t a one-and-done deal. It’s an ongoing process of serving the customer. The cause for conversion into free trial and the motivation for conversion into a full customer are one and the same. Problem: solved. Use the customer’s free trial motivation as the tool to drive engagement beyond the trial. To drive further into the reasons and motivations for attracting and retaining customers, do yourself the service of mapping the customer journey. Why? Because you’re going to experience an epiphany of sorts. Every customer is going to follow a path that takes them from awareness to completion. One of the most valuable insights from a customer journey map is that you will find out what customers do and see when they sign up for a free trial. You’ll discover whether it’s encouraging or demotivating. You’ll learn what obstacles they may experience when they move through the process. Pictures or diagrams are so much better at explaining things than I am. So, here’s what I want you to do. Look at this diagram for at least ten seconds. What do you see? I see that you’re going to gain 5-30% of a customer’s revenue at the initial sale point. I see that a whopping 70-95% of the revenue is going to come a week, a month, or a year down the road. To me that says that I need to take a long term view. Customers don’t prove their maximum value until some time has passed. It also tells me that customer retention is killer. Finally, it tells me that none of that revenue will materialize unless I close the sale. Forget 95%. I just need 5% right now! Even a longview of sales informs me that this is a critical point. So let’s get into some of the tactics. If you’re honest for a second, you’ll realize that you can’t make the customer do anything. You can, however, coax them to do something. That most important “thing” is called engagement. You see, the customer will only want to buy the SaaS when she actually experiences the value that it can provide. Engagement happens many times in multiple scenarios, but it all boils down to the same experience — value for the customer. In the critical pre-purchase stage, you must drive engagement. The entire free trial period should be designed around engagement — getting the customer to smell, taste, and feel the value of the product. Without engagement, there will be no purchase. Engagement is meaningless unless you actually understand what action causes engagement. 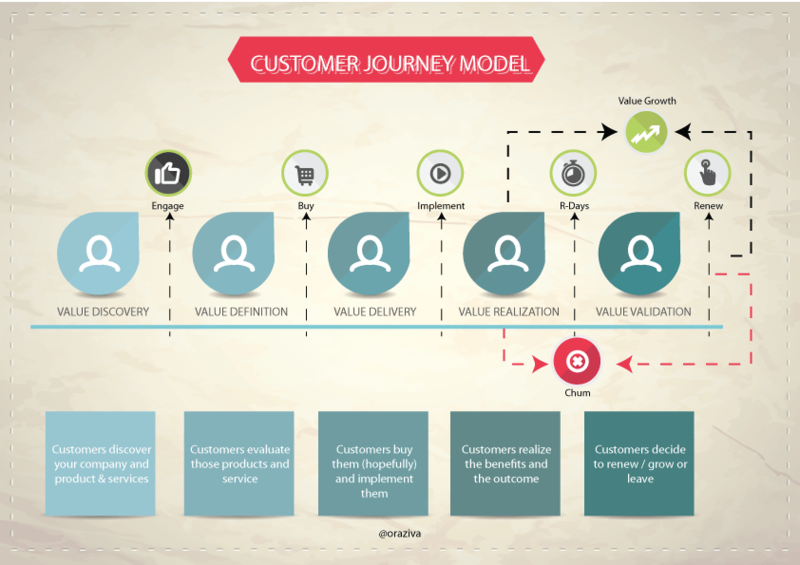 A customer can’t realize value from the SaaS unless he is doing something with the SaaS. Doing what? What do you want the customer to do? That depends on your product and your customer. 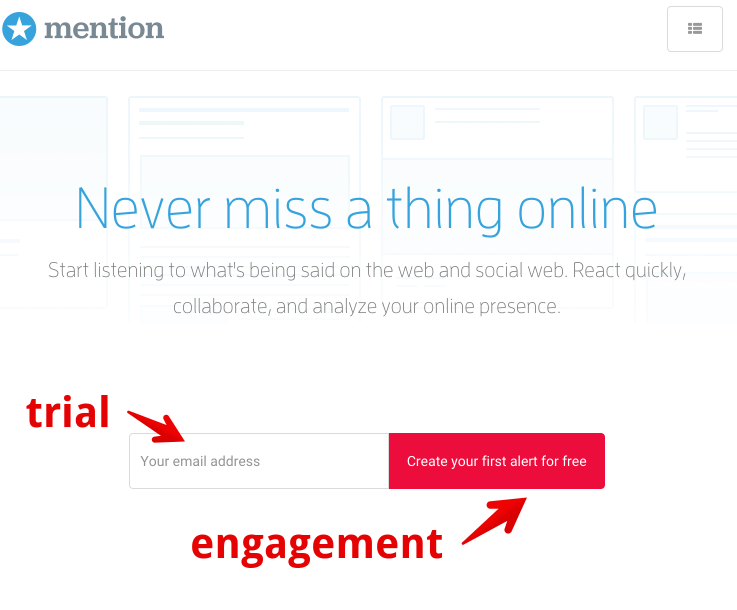 For Mention.com, as an example, that could be compelling their customer to create an online alert. So, what does Mention.com do with their free trial? They force customers to engage. The word force sounds all cruel and violent, but it’s actually quite kind and compassionate. Why? Because they want their customer to actually experience the value of the product right from the get-go. There’s no better way to do so than to engage and launch the trial simultaneously. Now, let’s talk about that little engagement action. Once you’ve decided what you want the customer to do, it’s time to make them do it. I used the word force in the preceding point. To divest the term of its negative connotations, let me provide a more cohesive set of suggestions around this concept. Email message play a critical role in this critical point in sales. How you say it matters. So how should you say it? Beg, wheedle, whine? No. Command them. Get them to do the action you’ve selected. Here’s an example of such an email. 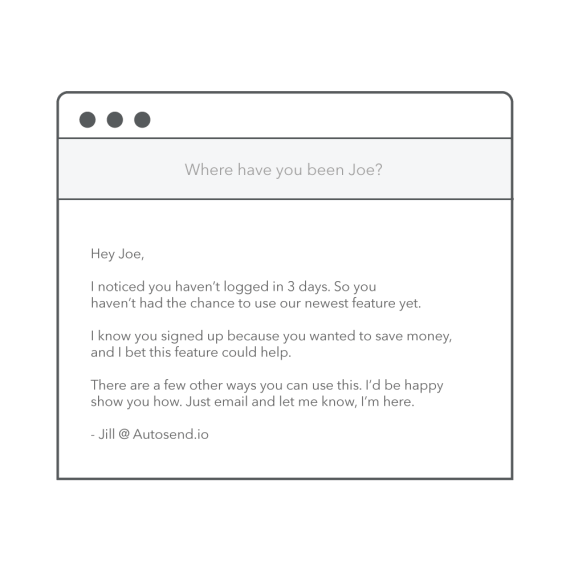 This email sample comes from Autosend.io, which provides an upsell schedule dashboard for SaaS. They want their trial lead to first log in. Makes sense. What do I mean by this? Show the customer that they will only experience the usefulness of the software if they do the specific action. Mint.com compels users to add a bill or an account. These two actions are presumably Mint’s engagement action, which will draw the user in to experience the value of the software. It’s kind of like a game. The user has to unlock the next level, so she needs to do a certain action. When the user does that action, give them a pat on the back. They’ve earned it. By applauding their action, you can drive them deeper into the experience and engagement of the SaaS. Remember, it’s all about action. The user needs to do. Trial users who stay active are more likely to convert. Notice how Totango sketches out the condition. 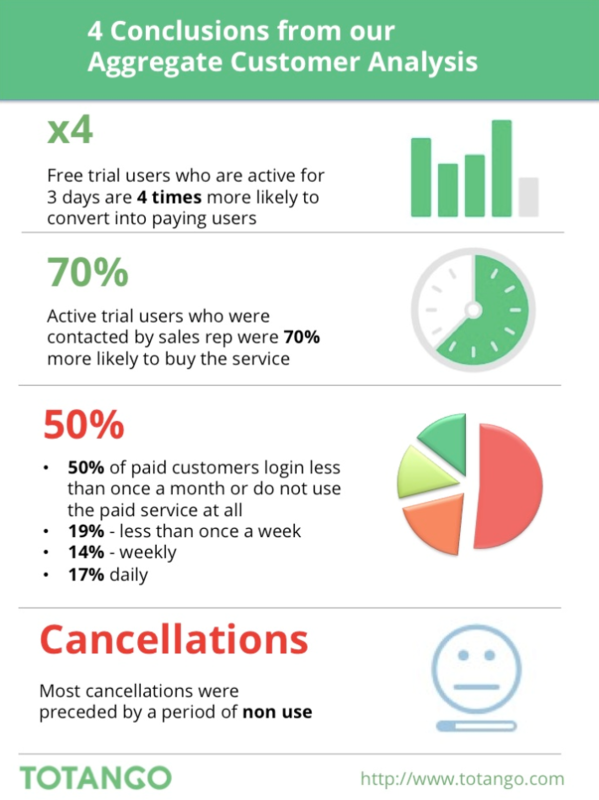 Trial users are 4x more likely to convert when they are using the SaaS for three days. The opposite holds true, too. A user who cancels is a user who’s not using the SaaS. By encouraging activity through a variety of methods, you will improve your success at engagement and sales. According to MIT and InsideSales, the odds of calling to contact a lead decrease by over 10 times in the first hour. You need to be calling them within an hour of them becoming a lead. If you don’t, the chances that you’ll connect with them drastically decrease. And you should automatically email the free trial user immediately. The customer doesn’t know what to do after they start the trial. You have to tell them. The way you do that is by sending them an email. What you say in that email is just as important. There’s a misconception that you need to send them an elaborate letter, complete with details, metrics, motivations, instructions, and all the other things that make for a warm-and-fuzzy welcome experience. Not quite. The shorter your email, the better. Here’s an example of a free trial expiration email that I received. Am I going to read that? No. It’s way too long. Will I read a short message like this? Short messages are important. You have several days and multiple emails to communicate with the customer – introduction, action, motivation, etc. The free trial is a process and a sequence, but you don’t need to give them every bit of information all at once. Shorten that email. No, shorter. Shorter…There. Your emails should follow a logical series of actions and activities that push the customer to full conversion. The better you get at converting customers past the free trial, the better you’ll get at SaaS marketing as a whole. Once you bring customers past the free trial, you can enjoy the massive revenue opportunities, upsells, retention, and awesomeness that follows. But first, concentrate on getting past that initial hump. What have you discovered as the best method for converting trial users into full customers?